FOX has released the synopsis for the second episode of Brooklyn Nine-Nine's upcoming fifth season, "The Big House Pt. 2", which airs Tuesday, October 3. Lou Diamond Phillips (Longmire), Toby Huss (King of the Hill), Tim Meadows (The Goldbergs) and Gina Gershon (Showgirls) guest star in the episode. When the warden (guest star Toby Huss) asks Jake to investigate Romero's (guest star Lou Diamond Phillips) drug smuggling operation, Jake and Caleb (guest star Tim Meadows) find themselves caught between the loyalty Jake has sworn to both of them. 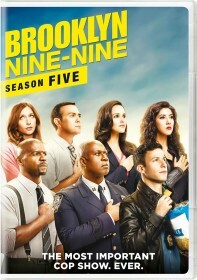 Meanwhile, Amy is offered a deal by a local mobster who claims he can prove that Hawkins (guest star Gina Gershon) is guilty, but Holt and the rest of the gang think they have a safer plan in the all-new "The Big House Pt.2" episode of BROOKLYN NINE-NINE airing Tuesday, Oct. 3 (9:30-10:00 PM ET/PT) on FOX.